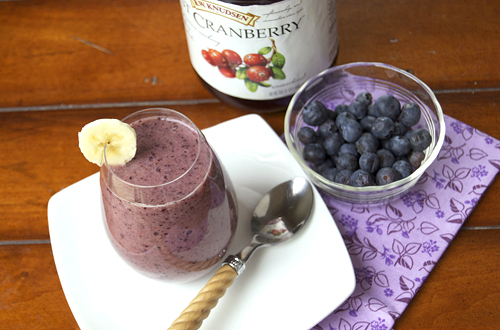 This smoothie uses unsweetened cranberry juice and no dairy, yet it tastes SO good! If you are not trying to cleanse, you could add milk to the recipe; I am sure it would be delicious. I also think coconut milk would be pretty tasty too. Keep your eyes peeled for the core of my cleanse, a detox green machine soup, which I will be posting next week! PS Have you entered my GIVEAWAY going on right now? If not head here to enter! There will be FIVE winners! Wow, it looks so thick and creamy, I’d never guess there’s no milk/yogurt involved! Tasty! Smoothies are such a lovely way to start the morning. I usually have a smoothie a couple days a week to start off my day. I usually add milk but I bet the unsweetened cranberry juice would be so delicious! Good luck with your cleanse! I made some blueberry smoothies last week that used green tea! They were delicious! I wish I made time every morning to make a smoothie. It is a great way to start the day! Looking forward to that coconut smoothie recipe! Oh Yum! I want this tomorrow for breakfast! The cranberry addition looks interesting! Will surely get some next time i make my foodie run! I’m a smoothie lover! My problem is that I hate bananas. Any suggestions for a substitute? Well if you want the milky feeling without the milk, I would say bananas, but if you are OK with milk I would just substitute milk in, or even almond/soy milk. even a half of a banana is healthy and you can hardly taste it!! I use a protein powder with a banana, a T of cocoa powder, 8 oz of lactose free milk and a lot of ice for a great smoothie….so adding the bluberries and or the Cranberry juice wold be easy to do… I actually have some pure unsweetend cranberry juice that I bought not long ago and since it was so bitter, I was going to just toss it!! Guess I’ll have to try it in my smoothies! Just wondering how long should a person be on this cleansing drink & how long does it take to kick in ? This isn’t a cleanse drink. There is a whole cleanse that I did called the Master Cleanse that went with this. 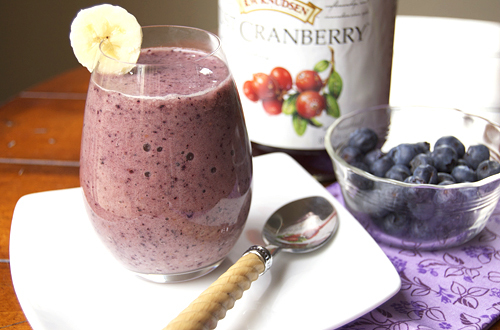 This is a healthy smoothie with detoxifying ingredients but should not be used as a cleanse. Hope that helps! Let me know if you want more information about the cleanse I did I can send it to you! Try just a forth of a banana. I’ve been reading a bunch of recipes from a variety of sites…other things they have used that might substitute could be: avocado, almond butter, coconut oil.